PHOTO BY PAT GAIETTO Seneca East’s Katrina Kagy (left) and Mallory Beamer jump for a block against Hopewell-Loudon’s Abbe Beidelschies. Columbian opened the volleyball season Saturday by beating Hopewell-Loudon 22-25, 25-16, 25-16 and Seneca East 25-22, 25-14. Seneca East downed Hopewell-Loudon 25-17, 25-20 in the other match. Emily Davis hammered 30 kills and came up with 13 digs for the Tornadoes in both of their wins, while Addison Conti tallied 37 assists, 19 digs and 11 kills. Olivia Jacobs (2 aces) added 24 assists and six digs, Riley Roggow chipped in 13 digs, 12 kills and four aces and Hunter Breidenbach had 31 digs. Amara Solomon (2 aces, 3 kills) added nine digs against H-L, while Toria Ingalls lined three kills against SE. Peyton Hoover’s 12 kills keyed Hopewell-Loudon in its matches. Abbi Roerdink tossed up 19 assists and Abbe Beidelschies had 12. Olivia Savidge belted seven kills for the Chieftains against TC, and Channelle Lyons lined four against SE. CONVOY — Allison Weithman nearly tallied a triple-double Saturday to lead Buckeye Central past Crestview 25-19, 16-25, 25-19, 19-25, 15-10. Weithman drilled 12 kills, handed out 34 assists and came up with eight digs for the Bucks. Lydia Ackerman (2 aces) chipped in 21 digs, Kendra Ackerman had 14 and Parker Phenicie added 12. Lexi Evak pounded 16 kills, four solo blocks and four assists blocks, Ally Sostowski had eight kills and seven digs and Courtney Pifher (2 aces) belted five kills. CASTALIA — Kaitlyn Kirian crushed 21 kills and Aubrey Bouillon dished 48 assists Saturday as New Riegel opened the year beating Clyde 25-21, 25-14 and Margaretta 25-21, 25-18. Kirian also registered five aces and seven digs for the Blue Jackets, and Bouillon had seven kills, six digs and five aces. Christen Hohman added 13 kills and nine digs, Jordan Hohman chipped in 12 kills and nine digs, Madalyn Reinhart came up with 10 digs, Brooklyn Gillig had seven digs and Julia Reinhart finished with six kills and three digs. 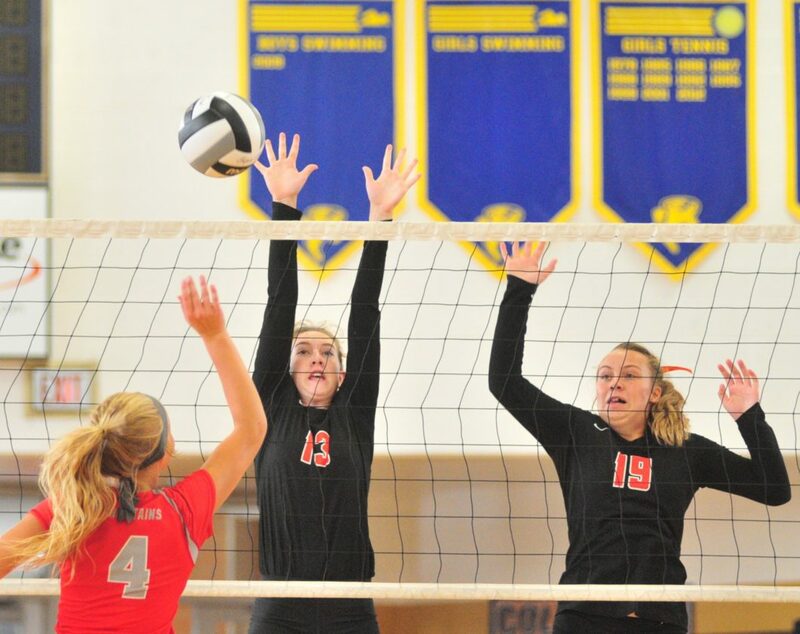 FOSTORIA — Fostoria powered past Ottawa Hills 25-11, 25-8, 25-19 Saturday. Tyriana Settles (2 solo blocks) led the assault by tallying 22 kills, seven aces and five digs, and Dakota Thomas tossed up 36 assists for the Redmen. Mary Harris chipped in 11 digs, six kills and three aces, Meredith Grine had 10 digs and three aces, Bailey Robinson lined four kills and Zoe Rice served two aces. UPPER SANDUSKY — Taylor Norris and Audrey Boes each tied a separate program record Saturday as Upper Sandusky blanked Clyde 9-0 in the season-opening girls soccer game for both teams. Norris tied the program for most goals in a game at five, a record she now shares with Megan Hensel, who set the original mark last year. Audrey Boes registered four assists to tie the other mark. She also tied the record last year, and now joins Grace Miller (2015, 2014) as the only two Rams to twice have four assists in a single game. Trudy Daughenbaugh (2016) and Bridgette Snow (2012) also each reached the mark in a game. Boes put the Rams on the scoreboard with 36:22 left in the first half, with Norris scoring the next three goals before Jenna Rodriguez found the back of the net with seven seconds left in the half for a 5-0 lead at the break. Norris added two more goals in the second half, with Rodriguez and Lindsay Weininger also scoring. Along with Boes, Alivia Oney tallied three assists and Grace Vent had another. Cortni Brown and Miranda Donnell combined in goal for the shutout, with Donnell stopping the only two shots Clyde could muster. Kendall Bailey had 17 saves for the Fliers.